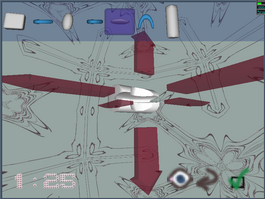 Ensemblist is a unique reflexion game created for the video game coding compo held in March 2003 in Paris. In this game, you have to put together several simple geometric primitives to build a given shape. For this, you can move, rotate and compose the primitives with the boolean operators union, intersection and minus. This is building what is called a C.S.G, for Constructive Solid Geometry. You will also need accelerated openGl drivers for you video board. Techniquely speacking, CSG needs at least 2 bits of stencil buffer (but the more bits of stencil buffer the better), and can make use of the KTX or WGL extensions to speed up copy from/to the zbuffer. Add a sound card to hear the music. And an HTTP connection to download new levels during the game. will install the game in /usr/local/games and /var/lib/ensemblist. You may prefer export DESTDIR=/somewhere/else to change the base path of the installation. Use GNU tools for better results. Some .sln and .vcproj files come with the tarball. Do what you know you have to do with them, but consider running a real OS one of theses days. For Unix/MacOsX, ask rixed@free.fr for some help. For Windows, bother contact dom@tatm.com.